Chintamani Chakra Avalokiteshvara is a Wish Fulfilling Form of Avalokitesvara with 6 Arms. He holds the Chintamani (Wish Fulfiling Jewel) near his heart. His other arms hold a DharmaChakra (Dharma Wheel), Mala, and a Lotus. The First Layer is the Short Heart Mantra – Om Va ra da pa dme hum – Beginning from the Top-Center. 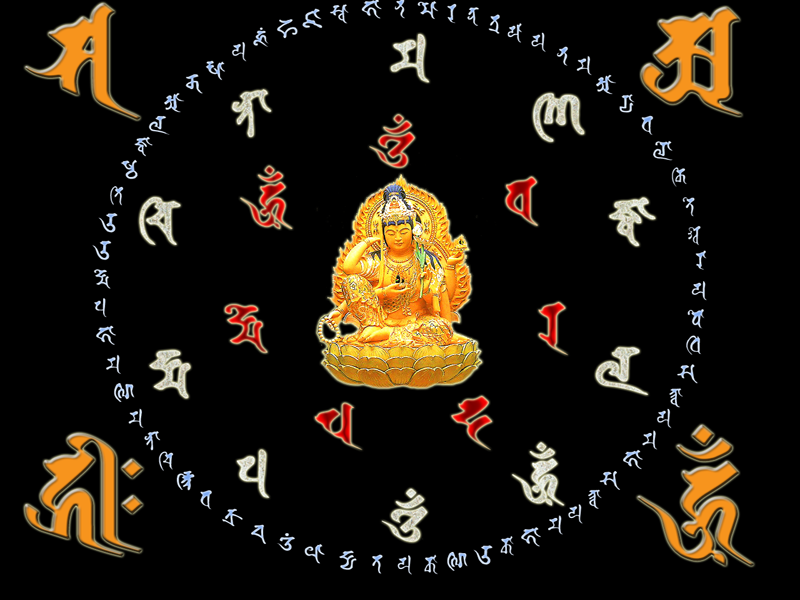 The Next Layer is his Long Heart Mantra – Om Pa dma ci nta ma ni jva la hum -Beginning from the Bottom-Center. The Next Layer encircling everything is the Complete Full Mantra – na mo ra tna tra ya ya na ma a rya va lo ki te shva ra ya bo dhi sa ttva … – Beginning from the Top Center. The Four Letter at the four corners are Seed Syllables (Bijaksharas) also written in Siddham. ~ by Vinodh on February 17, 2009. Does one need an empowerment or lung to be able to recite the above mantras of Chintamani Chakra Avalokiteshvara? Thats why its called a Dharani !. Dharani’s dont need any kind of Initialization things.